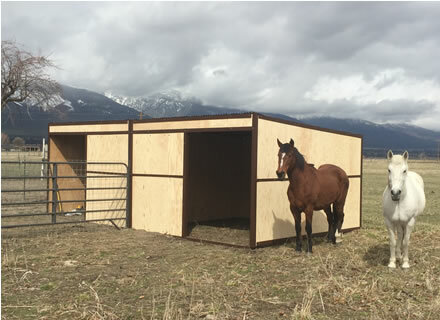 Quality custom horse run in shed frame kits for sale. 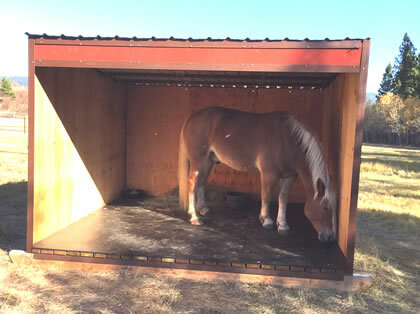 This horse loafing shed offers shelter, and protection to pastured horses from wind, rain, snow, and the summer sun. Frame kit is 10' x 10' or 12' x 12' and 8' high in the front sloping to 7' high at the back. 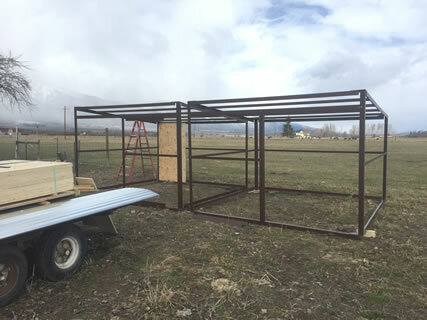 The shed kit has a 3" x 3" x 3/16" angle iron steel frame with 2"x 2" square steel tubing roof rafters. All frames are painted and pre drilled for easy assembly with the supplied 3/8" bolts. Frames are also drilled with 1/4" holes for fastening plywood to the walls, elevator bolts are supplied for this. Also supplied are self tapping sheet metal screws to fasten down a metal roof, drilling for the sheet metal screws is required by you to fasten down the metal building roof material. Easy to assemble, a 10' x 10' or 12' x 12' frame can be assembled in a short time, with some simple hand tools. One of the many advantages of a bolt together kit is the ease of assembly and disassembly to relocate it to a different location. All 10 x 10 or 12 x12 frame kits for sale, come designed and ready to bolt onto another 10 x 10 or 12 x 12 frame. 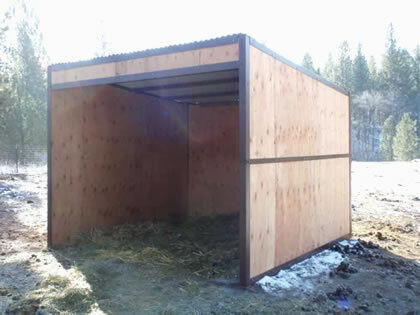 This allows you to construct a 10 x 20, 12 x 24 or longer horse shed, as well as making it easy to expand to a larger size building at a later date. All four walls are drilled to be bolted to any one of the four walls of another frame kit. This will also let you become creative with your horse run in shed layout. 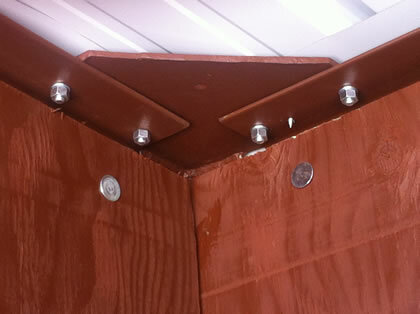 You could make a peak roof design by bolting the two open front walls to each other. Place the open ends of multiple frames facing each other with a four foot gap between them, cover the gap with a roof and have a barn with a four foot walk way down the middle. We furnish all nuts and bolts, assembly instructions, and a parts list. Phone support is also available if needed during assembly. Built strong with long lasting 3/16" angle iron frame. DIY Easy to assemble, and take apart. You supply the metal or wood wall and roof building material and save money. 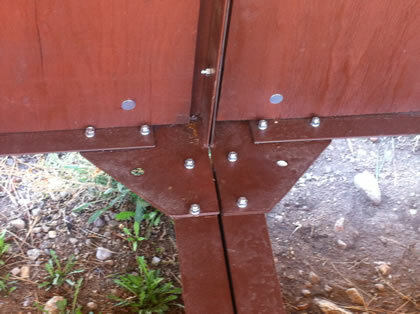 Can be anchored to the ground with stakes in each corner, fastened to fence posts, or concrete footings. Portable and predrilled to fasten to wooden or steel skids if desired. Run-in sheds provide health benefits beyond weather protection for your animals. Can also be used to store hay, or as a tack shed. Affordable option to having a large horse barn building. Contact us today for prices on your sizes with shipping to your area. Custom sizes and door and window framed openings are available upon request. Special - Finance with No payments and No interest for 6 months.